South Louisiana and food — what’s one without the other? It’s our favorite part of every event, meeting and get-together of any kind, and at weddings — we really throw down. Because we have such a robust local food tradition, couples tend to lean into those familiar food rituals when it comes to wedding cuisine. Even while holding true to local traditions, though, some things do change. “I’m seeing a lot more complete meals these days, even if they’re served buffet-style,” says Lafayette-based event planner Cassie Thibeaux of Southern Fête. Instead of a huge buffet with every Cajun dish you can imagine, the spreads have simplified to include just a couple of beautifully crafted mains, starches and sides, with defined appetizer and dessert courses. Buffets are still the preference of most couples in the Lake Charles area, says Allison Sonnier of Reeves Uptown Catering, but there’s an increasing trend toward planned tablescapes, where the tables are fully set as though a plated meal was going to be served, even during the passed hors d’oeuvres portion of the event. It offers a nice middle way between the elegance of plated meals and the flexibility of buffet meals. Couples throughout the region are having fun with their appetizers and hors d’oeuvres. This allows the couple to add that quirky personal touch while involving the guests and giving them a bit of an activity. Another favorite interactive station is the increasingly popular charcuterie board, says Thibeaux. “Not necessarily in place of passed hors d’oeuvres, but served at the same time,” says Thibeaux. 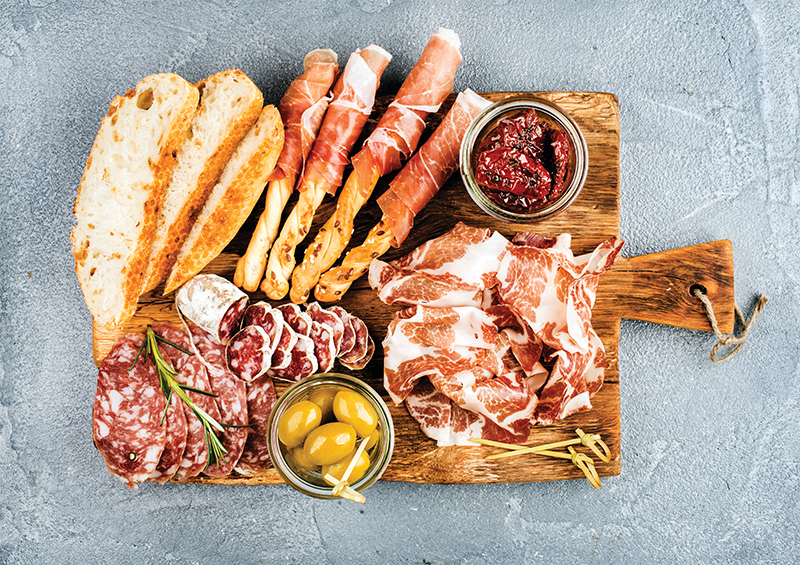 Cheese, crackers and specialty meats are great foods to snack on while sipping cocktails and Louisiana’s fabulous artisanal meat tradition allows for some fun local twists on this trend. Some trends that have hit the national stage have bypassed Acadiana almost entirely, and one in particular hasn’t made inroads at all, and likely won’t: alternative desserts, like macaron towers or multi-tiered cupcake or donut stacks. Sonnier reports the same in Lake Charles. Trends or no, Thibeaux encourages couples to go with what they really and truly love when it comes to food. French fries, nachos, mix-your-own-trail-mix, ice cream sundaes, seasoned popcorn, candy buffets… there are so many options. Hey, if you want boudin balls as your passed hors d’oeuvres and jambalaya and fried catfish as your main course, you go right ahead. First off, it’s your wedding and you should enjoy what you love. Secondly, no one in his or her right mind has ever complained about a boudin ball. The groom’s cake has always been an area of the wedding where you can get silly or funny, but don’t hesitate to stray from cake entirely: while you won’t be able to make a bleedin’ armadillo out of an apple pie, if it’s his favorite dessert, go for it.